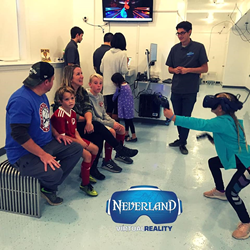 NeverlandVR, LLC (d/b/a Neverland Virtual Reality) announced they will host the area’s first electronic sports (eSports) tournament on January 24, 2019 from 6-8:30pm at their 209 East Market Street location in West Chester, PA. Players will compete for over $1,000 in cash and prizes by playing Beat Saber, a globally-popular virtual reality (VR) game that is set to music. Players slash blocks with light sabers to score points while avoiding oncoming obstacles, all in a fully-immersive VR environment. Players will compete using top-of-the line HTC Vive Pro headsets, which are considered the best in the industry. This tournament marks NeverlandVR’s first foray into eSports, an industry projected to reach the $2B mark globally by the end of 2019. A major distinction between seated mouse/keyboard eSports games and virtual reality tournaments is that VR eSports require physical exertion. The entrance fee for Neverland Virtual Reality’s Beat Saber competition is $25 until January 17, and $40 thereafter. Players must register at NeverlandVR.com in advance. All players must play in person at the company’s West Chester location, rather than participating online from home. The company plans to host other VR eSports tournaments in the future featuring popular games such as Space Pirate Trainer and Arizona Sunshine. About Neverland Virtual Reality: Neverland Virtual Reality is a tech start-up focused on delivering and distributing virtual reality (VR) technology in the entertainment, education, training, and mental health industries. The company opened its first “virtual reality experience center” on October 20, 2018 in the historic borough of West Chester in Chester County, Pennsylvania. It is the first company to offer “room-scale” VR experiences in the Greater Philadelphia area, and the first business of its kind in Chester County. Company co-founders are Josh Smith and Brady Bagwan, Army veterans who met while serving on the Korean Demilitarized Zone (DMZ) and the Al-Anbar province of Iraq as part of 1st Battalion, 506th Infantry Regiment. Neverland Virtual Reality is woman-led, with Lynn Bagwan at the helm. For more information, visit NeverlandVR.com.